1911: Choose Options 1911 Slide 3" 3.5" 4" 4.25" 5"
Colt: Choose Options Commander 4.25" Defender 3" Government 5" Officer 3.5"
Kimber: Choose Options 1911 5" Rail Compact 4" Custom 5" Desert Warrior 5" Gold Match 5" Micro 9 Pro 4" no rail Raptor 5" Royal II 5" Stainless II 5" Target 5" Team Match II 5" Ultra 3" Warrior 5"
Springfield: Choose Options Champion 4" TRP Operator Full Rail TRP Operator Half Rail XD-S 3.3" XD-S Slide XD/XDM/MOD2 3" Slide XD/XDM/MOD2 4" Slide XD/XDM/MOD2 5.25"
We produce products for the most popular make and model pistols, S&W, Glock, Springfield, H&K, Sig Sauer and many more. Please select your pistol from the Make and Model drop down! Comp-Tac offers additional Kydex bodies for most of our leather Kydex hybrid holsters that may be interchanged to make one holster adaptable for multiple firearms. The Spartan Spare Kydex bodies are a rigid material that are fit to each firearm and maintains their shape even with the pistol un-holstered. The smooth low friction surface allows for a fast draw and easy one-handed re-holstering of the firearm. The Kydex body will not bend or stretch over time and is impervious to sweat and solvents. NOTE: The “Slide” version allows the user to use one holster for similar guns of different lengths (such as Glock 9mm, .40, and .357). The Slide is typically slightly longer than the shortest gun of the series, and left open so that longer guns can ‘slide’ through the end of the holster. 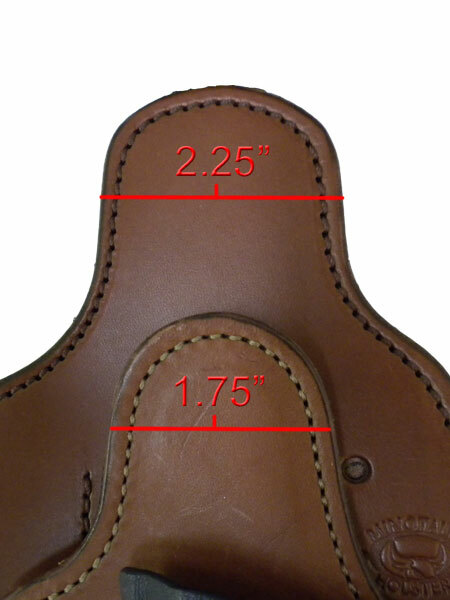 Not all Models will have the de-bossing (make and model) listed on the outside of the holster. We are working to update all of our models to have this, it is an ongoing process. IMPORTANT NOTICE! We no longer offer Kydex Bodies for Generation 1 leather backings. If your Spartan was purchased between April to September of 2010, please read below. The Generation 2 backing was introduced in April of 2010 and fully implemented in September 2010. If your Spartan was purchased before April 2010, you have a Gen1 Spartan. The Gen1 sweat shield measures at 1.75”"-2" across. The Gen2 has a wider sweat shield that measures 2.25" across.